Anne Helmenstine has been writing since 1996, primarily for online publications. She has worked as a scientist, consultant and college professor, as well. Helmenstine has a Doctor of Philosophy in biomedical science from the University of Tennessee's Oak Ridge National Laboratory. She also holds Bachelor of Arts degrees in physics and mathematics from Hastings College. A chai tea latte is a creamy, aromatic drink made from tea, traditional Indian herbs and spices and sweetened milk. The milk or milk substitute supplies protein and calcium needed to build muscles and bones, while the chai tea contains healthy antioxidants that may help prevent disease. Chai is a spiced tea made from black, oolong or green tea with traditional Indian seasonings. Common chai spices are cinnamon, cardamom, ginger, cloves and black pepper, A chai tea latte is made by mixing chai tea with milk or a milk substitute. 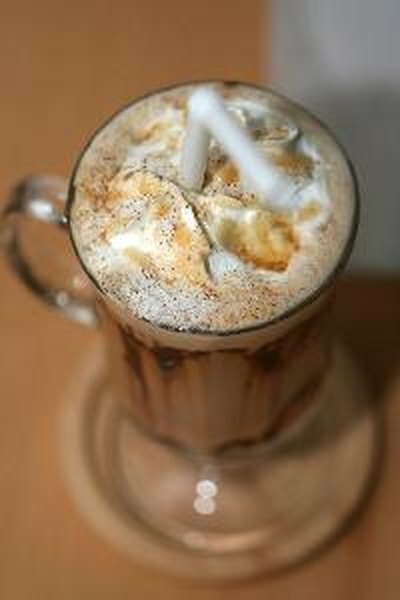 Most chai tea lattes include a sweetener to bring out the full flavor of the spices. Unsweetened chai tea does not contain any calories, fat, carbohydrates, protein or vitamins. Stirring in sugar or honey will add calories and carbohydrates. The milk or milk substitute adds calories, carbohydrates, protein, vitamin A, calcium, iron and may add fat. A 16-oz. chai tea latte made with nonfat milk has 200 calories, 0 g of fat, less than 5 mg of cholesterol, 95 mg of sodium, 44 g of carbohydrates with 42 g from sugars, 8 g of protein, 8 percent of the daily value of vitamin A, 25 percent of the recommended daily allowance of calcium and 2 percent of the daily value of iron. A 16-oz. chai tea latte made with soy milk has 230 calories, 3 g of fat, no cholesterol, 85 mg of sodium, 47 g of carbohydrates with 42 g of sugars, 5 g of protein, 8 percent the daily value of vitamin A, 25 percent the daily value of calcium and 6 percent of the recommended daily amount of iron, according to the Starbucks website. Caffeine is a stimulant that occurs naturally in tea. According to Tazo, a chai manufacturer, tea leaves contain more caffeine per weight than coffee beans, but the way tea is prepared results in a beverage with one-third of the amount of caffeine found in coffee. The caffeine content of a chai tea latte depends on the type of tea that is used, the season in which the tea was harvested and the location of the leaves on the tea plant. A 16-oz. chai tea latte made from black tea may contain 100 mg of caffeine. Generally, chai made from green or oolong tea contains less caffeine than chai made from black tea. There are exceptions, so check the product nutrition label for an average manufacturer value. Decaffeinated chai contains no caffeine or much less caffeine than regular chai. The tea in chai is rich in antioxidants, including flavonoids. According to the Tea Association of the United States of America, the flavonoids in tea neutralize free radicals in the body, reducing the risk of certain cancers, stroke, heart attack, high cholesterol and tooth decay. Drinking tea, such as chai, may decrease the risk of developing kidney stones or osteoporosis. Chai has its origins in Ayurveda. In traditional Ayurvedic medicine, the herbs and spices in chai are believed to have healing properties.